A trollers dream — the Shimano Tekota is the perfect cross-over reel for both freshwater and saltwater species, from walleye to tuna. Stainless steel ball bearings that have been through the A-RB treatment process which makes them at least 10 times more corrosion resistant than standard stainless steel ball bearings. Super Stopper uses a one-way, stainless steel roller bearing that eliminates backplay. This provides the angler with instant hooksetting power. This is a back up system to the Super Stopper that consists of the traditional pawl and ratchet. Should the Super Stopper roller bearing slip due to cold weather or over-lubrication, the Assist Stopper kicks in to provide a solid hookset the instant the roller bearing begins to slip. Most of the time the angler will not even know when this feature engages, because by quickly stopping the backwards rotation of the roller bearing, the Assist Stopper greatly reduces the chance of permanent damage to the Super Stopper, allowing it to continue to function as designed. When engaged, the clicker increases the tension in freespool and activates a clicking alarm to alert you when a fish bites. This handle grip material is soft to the touch and does not get slippery when wet. The button is larger and makes it easier to turn on and off. These single grip handles feature an extended shank with a counter-balancing weight on the opposite end of the grip. This reduces the amount of wobble during high-speed retrieves. For deep water situations or for anglers needing more leverage, the handle shank can be extended to increase the amount of power that can be applied to the retrieve. On wide-spool reels with a non-disengaging levelwind system, the levelwind remains engaged during the cast allowing the levelwind to track back and forth with the line as it flows off of the spool. This eliminates the drastic line angles caused by a disengaging levelwind system that can cause extreme friction which can lead to short casts or frustrating backlashes. By doing this we have increased the efficiency of the cast, allowing for more distance less effort. 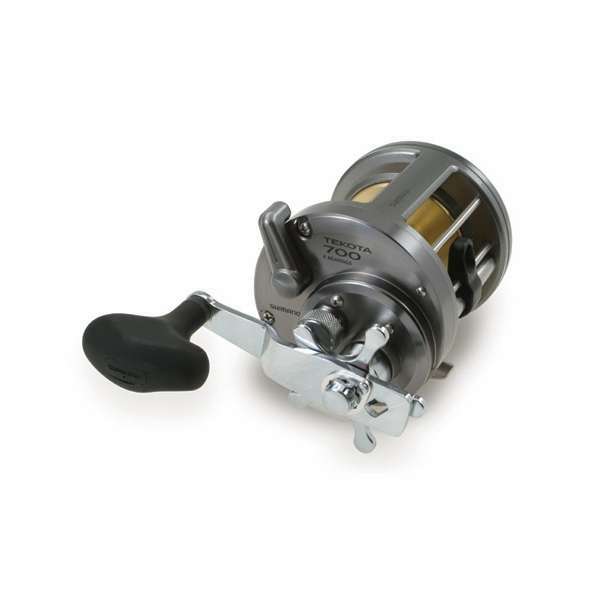 Comfortably rests between the thumb and forefinger when palming the reel, providing depth readings in feet. The reset button is strategically located for easy, onehanded resets, yet prevents accidental resets. Inserting one drop of lightweight oil into the sealed maintenance port keeps the linecounter performing in top condition. Allows more access to the spool for better line control, and provides more comfort when palming the reel. Paired with an 8ft Seeker Inshore rod with 20 lb mono leader + 50 lb braid it's my go to outfit for fishing for calicos in the kelp with bait off SoCal.. If I want I can also cast a 1/2 oz-3/4 oz jigheaded swim bait a mile it's that smooth running of a reel. If I also get a pickup on a 20 + yellowtail or schoolie Albacore it can handle that too. ProsSmall, solid, smooth drag and casts a flylined anchovy or sardine with no $#%@&* overruns. I like that I can freespool and let the bait swim around and then on the pickup engage the lever clutch,let the circle hook do it's thing and it's "fish on." Handles braid well. I made my first time purchase of the Shimano Tekota 800 reel from Tackle Direct in the winter and it instantly made me want to go fishing! We got striper fever off the NJ coast and bought another reel. Ya don't necessarily need this reel but if ya want to up your game and the fish to prove it -- go for it ! It is a beaut reel and will take care of business! Thank you TD for taking care of my tackle needs! I have had one of these for several years and wanted to add another one so I did. This is a terrific reel for striped bass and blue fishing. You can use it for all types of fishing , trolling, jigging, live lining or chunking. Love the smoothness of the drag and crank. Love the level wind. Great when casting bait when chunking or eeling, Great value of the mone. Had this particular model for a long time had to review it since itâ€™s been through so much. Handled bay rays in SF bay to 65 pounds, tons of sharks to 20-30 pounds; also got my bigger salmon up to 18 pounds on this reel as well. Not exactly what itâ€™s intended for but Iâ€™m sure the larger models will fare for a lifetime. Lol pretty much used it as a beater and loaner reel. Canâ€™t kill it, wonderful reel. Well worth the investment for trolling rods. THe level wind makes it easy to guesstimate line out to help with depth estimation when your trolling for stripers. These are my second tekota purchases, totalling 10 in all. I have mine paired with a stout 6 1/2 ft boat rod for deep water (250 ft and deeper) for big rock cod or lings in SoCal where a 16 oz sinker is a must. Great cranking power with 65 lb Power Pro braid. Get rid of those old big Penns and get one of these. ConsWhile it has an excellent handle I got an after market 5 " handle w/power grip for deep water cranking. Very nice reel used a few weeks ago for tog. Performed well. I have owned and used two Tekota 800 reels for six years. I bought them as strong reels with levelwinds as I often take very inexperienced people wahoo and mahi fishing. They have held up GREAT. I run 65 lb. braid on these reels and they hold miles. This because we could always tangle with a marlin. Hasn't happened yet, but we did land a 168 lb. sailfish recently. Surprisingly, these Tekotas knocked out my Saltist and Accurate bottom fishing reels. These Tekotas are just so smooth and strong, and I found it much easier to drag up the big grouper and snapper with these larger Tekotas than on the somewhat smaller but higher gear ratio Saltist and Accurate reels. And not having to use your sore thumb to levelwind abrasive braid all day is a plus. The levelwinds are strong and have never been challenged by big fish and big weights 800 feet down. I maintain my reels very well, soak in rainwater after every trip, partially disassemble and grease often, and these reels are still functioning like new. There is enough plastic on this reel to get scobbed up in hard use, but none of that stuff is structural. They still look good. I would not choose these reels for marlin or really big tuna, but these reels have the power and capacity to handle anything swimming up to maybe 200 lbs. And not having to constantly remind kids and rookies to thumb the line on retrieve is worth a lot. This reel is a workhorse! It is light, has plenty of drag and a nice low gear ratio. The low gearing allows you to easly land big fish without pumping the rod like a mad man. The levelwind is a bonus when dropping and reeling for seabass in 100' of water. With a levelwind, you don't need to worry about line lay and IMO it helps prevent backlash. I've owned the Tekota TEK500 for 4 years now and have nothing but good things to say about it. ProsReliable, low gear ratio, light weight, levelwind, line capacity, ect.. Very smooth and strong. I'm very happy with my purchase of 4 of them. Very user friendly. with the performance of this reel so far. Does this reel come in a left hand model? 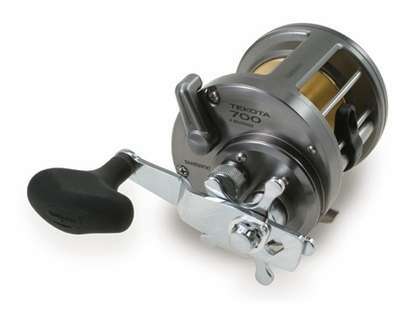 The Shimano TEK700 Tekota Reel is not available in a L/H model.